Chesley Fence & Deck is the leading installer of decking for homeowners in O’Fallon, Illinois, and other areas throughout the Metro East Region. Since 1967, we have maintained a reputation as the most trusted name in decking because we only offer premium products at competitive prices and install them with expert precision. Treated lumber – This option is ideal for homeowners who are looking for a highly affordable decking solution. We only use premium treated lumber, which can be stained or painted to our customers’ liking. Cedar– We utilize premium Western Red Cedar decking, which is cost effective and features a warm, natural appearance. This material also has superior durability, as it resists warping and repels insects. Composite – We offer a range of composite decking options; however, we usually recommend our Tamko EverGrain® Envision® PVC coated composite. 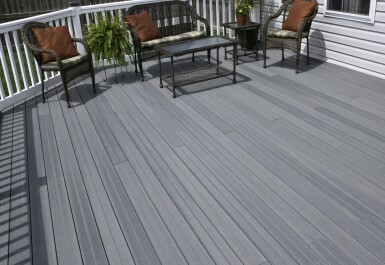 A deck made from this material is exceptionally durable and low maintenance and features a natural wood appearance. In addition to offering a range of premium decking products, Chesley Fence & Deck provides first-class customer care and expert installation services. Our unrivaled level of experience and expertise allows us to efficiently install our customers’ decks in virtually any configuration. 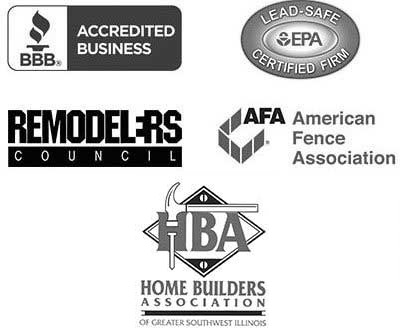 As evidence of our excellence, we maintain an A+ rating with the Better Businesses Bureau. To learn more about the decking we install in O’Fallon, IL, and the surrounding areas, contact Chesley Fence & Deck today.